2 figures. 1 comic book. Lots of fun! 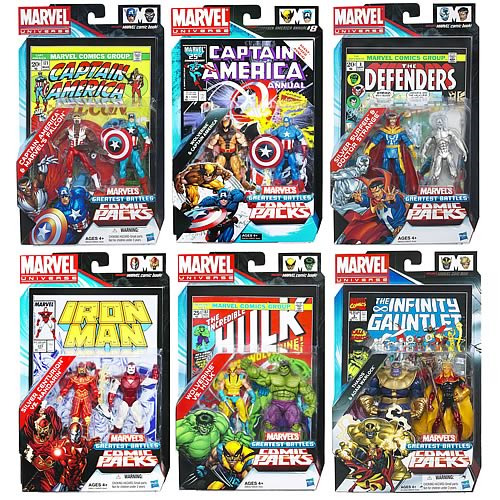 Celebrate the rich history of Marvel Comics with your favorite 3 3/4-inch scale action figures! Case includes 8 action figure 2-packs... 16 figures in all. Incredible articulation and amazing detail! Celebrate the rich history of Marvel Comics! The legends of the Marvel Universe got a little bit smaller. These collectible action figures include incredible articulation and amazing detail, and are perfectly scaled with your other 3 3/4-inch-sized toys. Marvelous mutants, superb superheroes, and venomous villains are all here. And each 2-pack includes a comic book! Ages 4 and up.